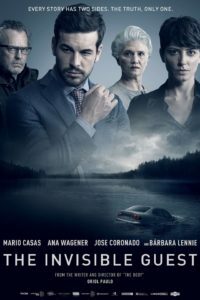 The Invisible Guest (2016) (Spanish: Contratiempo) is a 2016 Spanish crime thriller by director and writer Oriol Paulo. The intricate plot will leave the viewer spellbound . Adrián Doria, a successful business entrepreneur, husband and father, is knocked unconscious, and wakes up in a locked hotel room to find the dead body of Laura Vidal, his married lover. Charged with murder but wealthy enough to be out on bail, Adrian soon learns that his lawyer, Félix Leiva, has hired the renowned defense attorney, Virginia Goodman, to represent him. She visits him late one evening to inform him that a witness has come forward to testify against him. He must tell the whole story quickly so she can prepare his defense. Goodman pulls no punches in the resulting cat-and-mouse game. No spoiler alerts here! Suffice it to say that you must pay attention with every scene, even though–as in many foreign films–the pacing sags in the middle. The viewer will be rewarded, however, with clues and red herrings that are purposeful and complex, not suspecting how the interconnections make sense. The Invisible Guest requires more than the usual demands on the viewer’s attention in order to follow the plot. Just when you think you have a reasonable explanation for what has taken place and who the probable perpetrator is, a new scene with a different point of view enters, and you are wondering again who is guilty of the crime. The story becomes so populated with different points of view and arguments back-and-forth with Virginia Goodman that the viewer is engaged up to the final reveal. The narrative and plot remind me of Gone Girl with a number of unreliable versions of the crime scene. This masterpiece consistently changes the game, raising more questions than it answers. Consequently, the viewer parses the dialog and several accounts of the crime into puzzle pieces– but they don’t fit. The Invisible Guest is crafted so well that you don’t see the intricately woven web unravel as it does. There is always the who before the why. The Invisible Guest is a winner! This Spanish gem is thrilling, suspenseful, mind-blowing, an edge-of-your-seat riveting tour-de-force for thriller/mystery enthusiasts and psychological film-noir fans. 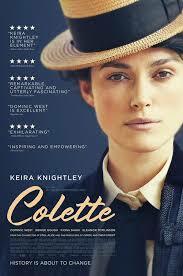 “Colette,” opens in the countryside of rural France as we meet the young Sidonie-Gabrielle Colette (Keira Knightley) at home in Burgundy. In short order, a successful Parisian writer known as “Willy” (Dominic West) pays a visit to Saint-Saveur-en-Puisaye, and before long he and Sidonie are enjoying an energetic romp in the hayloft. Soon after, Sidonie (destined to be known simply as ‘Colette’) is installed as his wife in Paris. But when Willy begins having problems with creditors, he convinces her to write a novel under his name. In fact, he locks her in a room! “Write!” he bellows. So she pens a story about a sassy country girl, “Claudine,” which becomes a literary sensation. Willy wants yet another novel from her and another. And so it goes. She will not write a book under her own name until she breaks with Willy, a wily philanderer, in 1906. In fin de siècle Paris, Colette will go from enabling wife to the grand-mere of feminist literature and a bisexual adventuress. 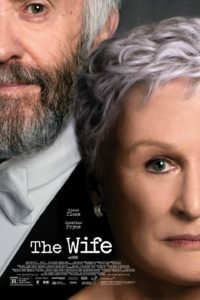 In this beautifully filmed biographical drama, you can track her transformation by her clothing—from the yellow country dress to the mannish suits. When her husband buys her an expensive Parisian gown— at a time when society ladies were dripping in jewels and wearing extravagant designs— she wants no part of it. Indeed, her idol was Amantine Lucile Aurore Dupin, who wrote under the pen name George Sand and preferred wearing men’s clothing. Colette’s self-confidence changed a country girl into a fashion icon, the most photographed woman of her time. Doing so, according to the director Wash Westmoreland, at a time when a woman could have been arrested in Paris for wearing men’s clothing. The film is a joy! Oscar-whispers are circulating for Kiera Knightley. Marty Byrde (played by Jason Bateman), his wife Wendy (Laura Linney), teenage daughter Charlotte and son Jacob continue as criminal minds laundering money for a Mexican drug cartel with roots in Chicago. The introduction of Helen Pierce ( the stunning Janet McTeer) as the attorney for the drug cartel ratchets up the ruthless and cunning subplots that made Season 1 of “Ozark” (see September 20, 2017 review) so addictive to watch. The Byrdes are finally settling in to the Ozarks, compartmentalizing their illegal activities which they excel at with their determination to instill family values in their children which they fail at. Dangers are everywhere–within their family, obviously from the cartel, but also from an Ozark family “cursed” to a life of crime–the Langmores– and from another Ozark family–the Snells– who are heavily involved with both local politics and maintaining their own hold on distributing illegal drugs from their “poppy” farm. Ironically, Ruth Langmore (talented newcomer Julia Garner), yearns for a way out of the “curse” blocking her attempts to find the family and values she wants. All three deformed families conjure up writhing snakes in a pit in which survival is ugly, bloody, and momentary advantage is the key stratagem. The Byrdes find that every transaction involves betrayal, violence, and passive witnessing of atrocity. In the process, each member of the family gives up a piece of themselves until there is not much remaining of themselves to give up. Marty’s mantra is that we all make our own choices and are responsible for how our lives turn out. 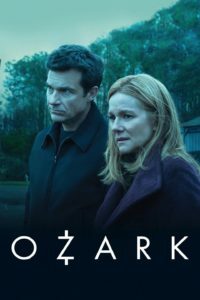 But “Ozark” demonstrates–like “Breaking Bad” and “Dexter”–that circumstances can limit our options, until we become so flawed that we feel cornered and trapped with no options. In Ozark season 2 we wonder how it will end: Will the Byrdes – and their children – ever be able to feel safe, secure, and content? This season is even better than the first in tackling the corrupting power of wealth and greed, human nature, and the ties that bind a family and define it. Note: Ozark is a Netflix Original series.